•	Creative Labs visitors will be able to save on all of their orders by using the coupon codes sent out via the free email newsletter this company publishes. Customers can sign up right on the homepage and get an instant discount of 10% off of their first order. •	All orders of at least $35 placed on the Creative Labs website ship free of charge to addresses in the US. Customers around the world can purchase from this company, too, but will have to pay extra for shipping. •	Check out the SALE section of the Creative Labs website for the most up to date specials and deals. These offers are changed out every week and replaced with new ones. 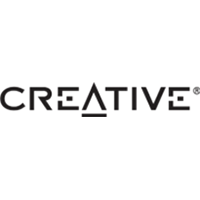 Creative Labs is in the business of producing quality sound products and accessories for desktop and laptop users. Most of their popular products take advantage of advanced sound equipment and hardware solutions that the company has pioneered, though they have recently begun to get into amplification and interface hardware options that are becoming popular as well. Creative Labs gaming headphones, traditional headphones, and web cameras are considered to be right up there amongst some of the very best options are available, and the software solutions and drivers they provide a regularly updated so customers get the most out of their purchases. For most up to date offers check out Creative on Facebook and Twitter or contact Creative Support for any questions.